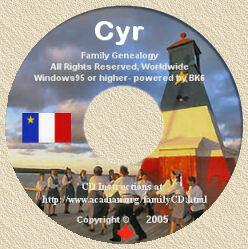 Acadian Genealogy Homepage; (PAF) Personal Ancestral File! Ancestral Quest (AQ) family tree software is the easiest to use and most versatile genealogy program for Windows on the market. Its format is perfect for the beginner and yet powerful enough for the most advanced genealogist. Easy data entry, keyboard shortcuts, scrapbooking, and excellent sourcing capabilities are just some of this genealogy software program's wonderful award-winning features. Create professional looking Pedigree Charts, Family Group Sheets, Ancestry charts, Descendant charts, genealogy book reports, fan charts and more. AQ has special links to on-line genealogy databases, including Ancestry.com and FamilySearch.org, which can help you research your family history more easily than ever. Ancestral Quest has special features to aid the Jewish researcher. Print a Page of Testimony for Holocaust victims. * Compare and Merge databases! AQ can compare another AQ 12, PAF 5 or a GEDCOM file against the current file, to help you identify the differences. Import just the changes. * Edit both AQ12 and PAF 5 databases. * Translate AQ into any language and store names and places in any language. * Improved, all new Merge interface makes merging individuals even easier! * Publish a family book with selected report options, a table of contents and index! * Record DNA Test data for each individual.